Now I know that “natural” is a bit of a meaningless marketing term but I was still pretty surprised by that list. Is that really different from “regular” peanut butter?? Okay, so the “natural” peanut butter is slightly better than the regular peanut butter but it’s still far from truly natural peanut butter containing only peanuts. Tags: grocery store lessons, natural, peanut butter | Permalink. Hello fellow Bluenoser :) I’ve just recently started eating the actual ‘natural’ peanut butter and it’s amazing the difference in taste, compared to the standard smooth or creamy ones sold by Kraft et al. I still find myself lusting over a bottle of the sugar added PB. It’s hard to break the addiction when you’ve been doing it for so many years. Mmm that does sound wonderful. I’ve dipped into make my own almond butter as well, and I really find that’s a special treat, since it is so fresh. I had to laugh at the recent line extension done by Kraft to include all these new flavors like cranberry, banana, honey, etc. Most be working for them though. Oops! Just realised I called you Rob. My apologies Steve! Making your own nut butter is a great way to go. Then you can mix and match your nuts and seeds. I tried the cranberry Kraft peanut butter (for science/knowledge, of course). It was so sweet and processed you could hardly tell it was ever peanuts. I appreciate you taking one for the team and giving it a try. Science is hard work, but someone has to do it! There really is something satisfying about making nut butter. I love being able to spice it up as I wish, with cinnamon or nutmeg, etc. Also it is disappointing to see “palm oil” as it is the production of palm oil that is pushing orangutans to extinction. I started reading this article and was hoping for a more educational one, but you stopped short of discussing the WHY. It would be great if you didn’t assume that everyone already knows why one oil or sweetener is is better or worse than another. A lot of people don’t understand the term, hydrogenated, either. This was a missed opportunity to inform, and to point us in the direction of a better peanut butter brand that the ones shown here. 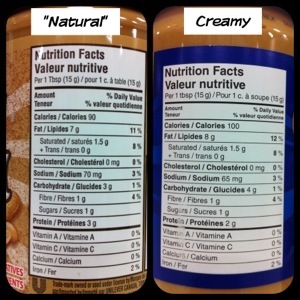 I’ve also noticed that many of the “natural” peanut butter brands used to have to be refrigerated, but now they don’t…why is that? My point was that any added oil or sweetener in a nut butter is unnecessary. Thus, getting into the merits and pitfalls of these additives was not relevant to this particular post. 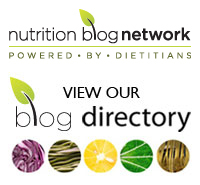 I have discussed both sweeteners and oils/fats on the blog in the past. Any truly “natural” nut butter should be refrigerated after opening as the polyunsaturated oils in the nuts are prone to going rancid. I’m not sure why any would say that they don’t need to be refrigerated after opening unless they are not actually natural (like the one discussed in the post). This was the first time I’ve read your blog. Maybe the article could include links to your other posts about oils and sweeteners?